The Samsung EcoBubble is a smart, futuristic machine with touch control settings and an additional special feature is that there is even an app to link it to your smartphone for trouble shooting instructions. It has a lovely big wide door which opens all the way out, best of all the door is made in a lovely futuristic crystal blue which, combined with the smart chrome finish, looks fantastic in your kitchen and will certainly be remarked upon. If you are looking for something that stands out from the crowd you won’t go far wrong with this beautiful machine. This model features, as the name suggests, Samsung’s specialist EcoBubble system. The drum is specially designed with many very small apertures so that when the machine is filling, the water is forced through the holes making bubbles. These bubbles permeate your clothes getting really deep into the fabrics. They also dissolve the wash powder or tablets quickly bringing the soap to a bubble. 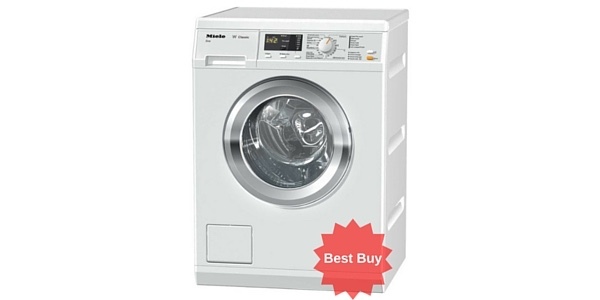 The machine spins at 1400 rpm which, because it has such a fast spin, means your clothing and bedding, towels, sports kits and baby clothes get a thorough and powerful clean. 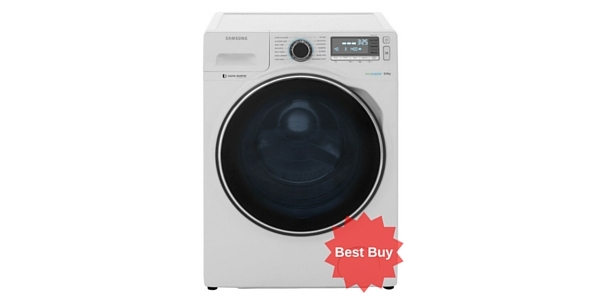 The SamsungEcoBubble has 14 different wash settings including a quick wash which completes in less than an hour. It has a special Ecowash which washes at just 15°. The EcoBubble technology ensures a powerful clean even at 15° and customers were surprised how efficient this wash cycle was. The advantage of washing at lower temperatures is that you will save energy on heating the water thus minimising your carbon footprint and saving £££s off your fuel bills. The eco cycle steeps the washing as well as churns it, meaning there is less power used in turning the drum during a wash and it does as good a job as if you had washed at 40°. 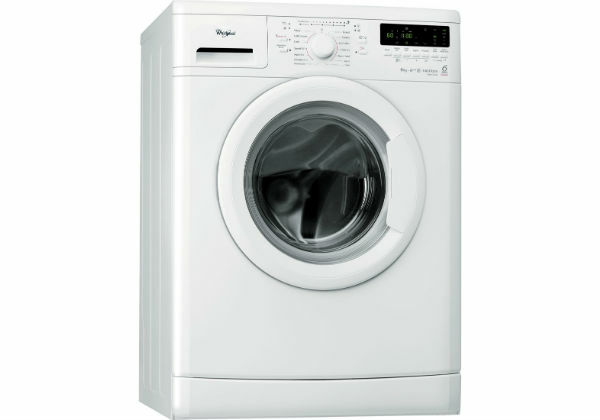 With a five year manufacturers warranty guaranteeing the product, you can expect many years of life from this machine. It is sleek, bang up to date, fantastically attractive and a great quality build. It is quiet to run also, running at between 72 and 74 db. it has a massive 8 kg drum which will wash a double duvet and will fit a very large load again making it more economical to run. 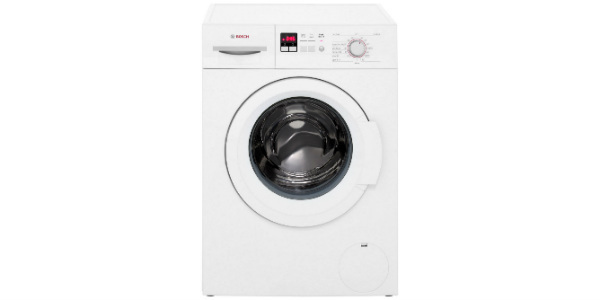 It has all the frills you would expect from such a lovely machine, is easily programmed and has a timer that tells you the time in minutes of the programme you are going to use in advance so you can be sure you have selected the right one. It will then count down to the end of the cycle and play a nice little tune at the end. With a 24 hour delay timer as well, you will always know what you are doing with this machine. Best of all the drum has a light at the back so you are not likely to leave anything behind in the drum when you are finished. This machine will cost you roughly about £21 year to run and is A+++ energy rating which is the best you can get. The dimensions for your kitchen are 85 x 80 x 60cm . 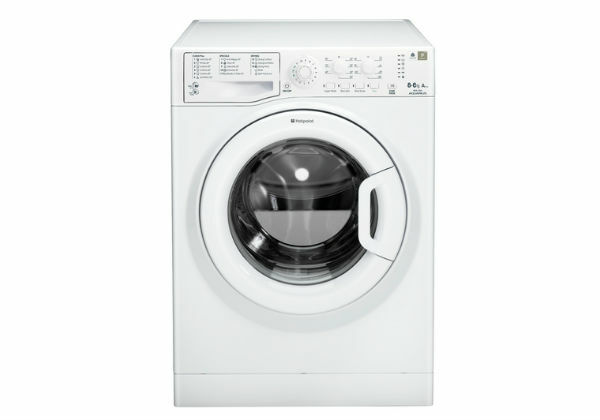 If you are eco minded and looking to save money on your fuel bills without sacrificing efficiency look no further than the Samsung Ecobubble WW80H7410EW Freestanding Washing Machine in White and Blue, it will give you a powerful clean thanks to the ecobubble technology at lower temperatures. It is cold fill only and automatically detects when you have a half load by weighing your clothes so that you only use and warm the water that is needed. For those busy parents there is a tamper proof child lock too. Futuristic and efficient pleasing to use, easy to programme with the LED touch sensitive screen, not forgetting the smartphone app and the light in the drum. This machine is quality made and you won’t regret buying it.